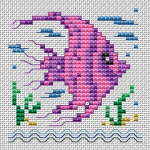 Small cross stitch pattern of a purple tropical fish. Cross stitch pattern of a dolphin playing with a ball. Wonderful cross stitch pattern of a wolf in winter setting. Beautiful spring birds among blooming lilacs. Adorable pattern of an owl for kids and beginner stitchers. A wise old owl sat in an oak; The more he saw the less he spoke; The less he spoke the more he heard; Why can’t we all be like that wise old bird? 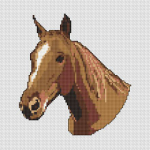 Cross stitch portrait of a horse in wonderful browns and ochre. Cute cross stitch of a Siamese cat pleading next to two hearts. Cross stitch pattern of twin dolphins on a blue background. 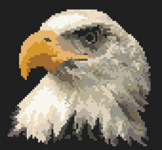 Cross stitch pattern of a wild duck in water designed with only 14 colors. Simple but elegant cross stitch pattern of a swan for beginners.The chart contains only full stitches.